Heat pumps are an efficient form of commercial electric heating for mild and moderate climates. This type of HVAC unit provides up to three times more heat than the amount of electric energy it consumes. At AAA Heating & Cooling, we are serious about HVAC safety and believe that business owners should have peace of mind at all times regarding fire risks and electrical problems. Our highly-trained commercial heating and cooling technicians are available to inspect and service your commercial heat pump to ensure that it is in working order and safe to use. In addition, the maintenance and installation team at AAA Heating & Cooling takes pride in providing the best possible service to our customers in the Portland and Vancouver metropolitan areas. With regular maintenance, your commercial heat pump will operate safely and efficiently for years to come. We offer routine maintenance checks and are ready to troubleshoot and remedy any malfunction for your commercial heat pump. Additionally, AAA Heating & Cooling can install a completely new heat pump unit for your business. We also offer 24-hour emergency service for any last-minute HVAC needs! Many businesses rely on heat pumps to provide their commercial space with both warm and cool air throughout the year. After years of use, some heat pump units will begin to malfunction and it may not be easy to diagnose the cause. Common commercial heat pump problems typically include failure to turn on, failure to produce heat or airflow, or failure to cycle off. The best way to prevent malfunction and keep your commercial heat pump running efficiently year-round is to schedule regular service appointments with a trusted HVAC technician. 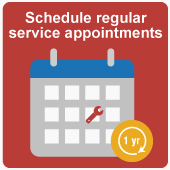 AAA Heating & Cooling’s Planned Service Program makes routine maintenance easy for business owners. The program offers discounts to our commercial clients with prepaid annual HVAC service as well as priority status when last-minute repairs are needed. All commercial heat manufacturers recommend annual maintenance for keeping heating and cooling equipment running efficiently. During a service appointment, our work will be done to code and follow manufacturer recommendations. If you are unable to troubleshoot your commercial heat pump issue, the expert HVAC team at AAA Heating & Cooling will be able to address the problem and get your unit running efficiently again. Heat pumps that are properly installed and regularly serviced will provide reliable climate control for your commercial space for many years. Routine maintenance checks will prolong the life of your commercial HVAC unit and keep your energy bills low. Our expert diagnostic technicians are able to prevent the need for future repairs so you won’t need to utilize our emergency service. Faulty heat pumps typically take a full day to repair. The AAA Heating & Cooling commercial HVAC technicians will work around your operating hours so your business has the the least amount of disruptions as possible. Our highly-skilled team can also assist with installation of a new heat pump for your commercial space. We are experts with regard to proper selection and sizing as well as the technicalities of correct installation. Our technicians are NATE-certified and trained in determining the HVAC needs for any type of business. In doing so, we are able to fulfill each of our customers’ exact heating and cooling specifications. AAA Heating & Cooling follows guidelines from the EPA (U.S. Environmental Protection Agency). We will not release chemicals into the air and always follow protocol for responsible disposal of HVAC parts and equipment. For more information about service, repair, or installation of a commercial heat pump, contact us today!